Register your .co domain name today! .CO is Short, SEO-friendly, and Global. .CO is the first truly global, recognizable domain to come along in years. Understood around the world as an abbreviation for "COmpany", "COrporation", and "COmmerce", .CO domain names are easy to recognize, simple to remember, and flexible to use. It offers international recognition in a fresh landscape where you can still choose the name you want, not just settle for what's available. How to start your .co website? 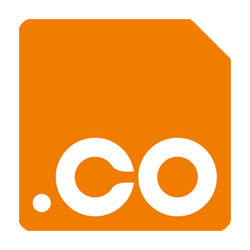 Find the perfect .co domain name using our search tool. Register it in minutes! Publish your content and let our team help configure any needed settings to help you go live with your .co website and email.